The Mind Station connector is a revolutionary device that extends the life of any Internet- enabled Quantum Leap or LeapFrog. toy. Use it to link to the Internet where you can get new activities for your toy. The Mind Station connector provides access to the LeapFrog Never- Ending Learning Club which allows you to get new activities for your products and see progress reports. The Mind Station also allows you to customize your child's learning experience. How does it work? 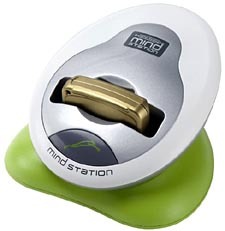 Plug the Mind Station connector into your PC Pop a cartridge into the Mind Station connector Download new activities from Leapfrog.com onto the cartridge Put the cartridge into your Quantum Leap or LeapFrog toy and play Remember, you'll need an internet connection to make it all work. What toys work with the Mind Station? LeapPad and LeapPad Pro Learning System Imagination Desk Turbo Twist Spelling Turbo Twist Math Turbo Twist Vocabulator Turbo Twist Fact Blaster School-Time LeapTop This product allows you to download additional games and educational curriculum from leapfrog.com. After playing, upload results for an on-line progress report and customized recommendations. Download additional content for each of your Quantum Leap LeapFrog Mindstation products.